Speedweeks 2017 is off to a flying start for Hendrick Motorsports. Sophomore sensation Chase Elliott won the pole for Sunday’s Daytona 500 for the second consecutive year Sunday, turning a fast lap of 192.308 mph. HMS teammate Dale Earnhardt, Jr. will start second. "Everybody at Hendrick Motorsports has done a lot of work this off-season," said Elliott, the first driver to claim back-to-back Daytona 500 poles since Kenny Schrader turned the trick in three straight years; 1988-1990. "This team definitely has a knack for these plate tracks… but that stuff doesn't just happen by staying the same. Everyone is always trying to get better and make their cars better and faster; and the engine shop is always finding new things. I'm happy to be a part of it, and hopefully we can run good next Sunday." Twelve months after Earnhardt suffered multiple solo spins in Turn Four of the 2.5-mile tri-oval, Johnson lost control twice in Sunday’s 75-lap, non-point Advance Auto Parts Clash. The defending series champion survived the first incident, bouncing off the Ford of Kurt Busch and sending Busch into a spin that ended his day. Johnson’s second crash was more costly to the Lowe’s Chevrolet team, inflicting damage that ended their day with a 16th-place finish in the 17-car field. “It’s bizarre, because it drove really good everywhere else,” said Johnson after his second solo crash. “The first time, I had a handling problem when it broke free and I got into the No. 41. Then after that, it was really loose (during) the last long stretch, before I crashed again. 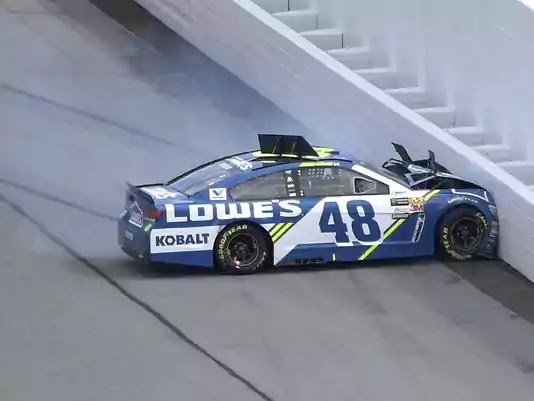 “I would have to assume that it’s relative to the height of the rear spoiler,” said Johnson, a seven-time Monster Energy NASCAR Cup Series champion who has uncharacteristically crashed out of six consecutive Clashes in the last six years. “When there is less air and the air is so turbulent back there, the spoiler is so small it’s real easy to get the pressure off of it. Johnson’s struggles were not lost on Dale Earnhardt, Jr., who viewed the procedings from the FS1 television booth while Alex Bowman drove his No. 88 Chevrolet to a third-place finish in the Clash. After spinning three times in virtually the identical spot during Speedweeks 2016, Earnhardt expressed concern with the Hendrick organization’s big-track handling package. Within minutes after exiting his damaged racer, Johnson was already speculating that Sunday’s bright sunshine may have impacted the performance of his car. “The sun certainly sits on that (Turn Four) edge of the track a little bit harder than anywhere else,” he said. “We will take some notes and learn from those mistakes and apply that to the 500 car. Hendrick’s on-track struggles may force the organization to abandon its recent policy of practicing minimally at Daytona, and drafting virtually not at all. Sources close to the team say both Johnson and Earnhardt will do a good deal of pack racing in this week’s practice sessions, in an attempt to diagnose and cure their continuing issues in the draft. They better figure out what the #48 team is doing wrong (cheating) before Sunday or the #48 will take out half the field in The Big One! No way the 7 time champ doesn'tknow what is going on with that car! And Jr. Is worried about those spins the #48 took in the clash, brought back bad memories about his Daytona spins! And if you were listening during his Clash broadcast, Hendricks better stop whatever they are doing that is causing those super strange spinouts! Sure would hate to see an end of a career due to cheating! It was pretty obvious in the Clash that the Hendrick guys are behind the JGR Toyotas and Penske Fords and also their former satellite outfit in Stewart-Haas. Casey Elliott does not look like he can handle having to fight for the lead as mediocre as he looked in traffic in the Clash. Totally agree! Either Joey or Kyle B will end up the Champion this year!